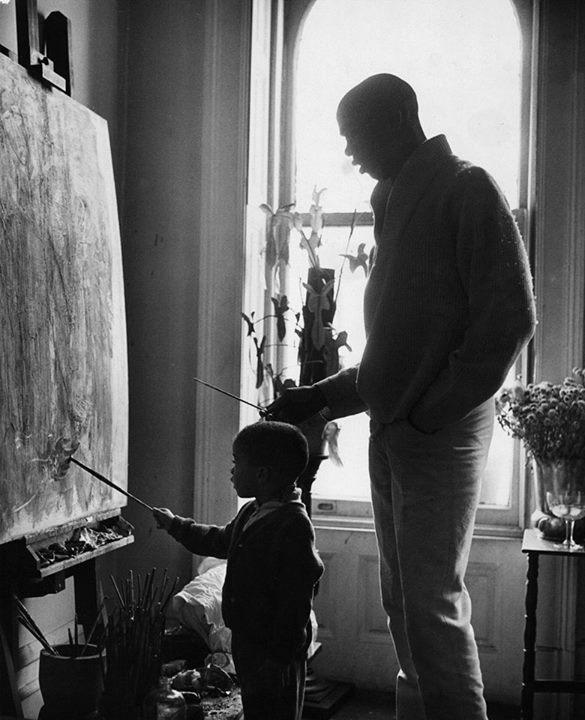 Leo Holder, Geoffrey Holder’s son, wrote the following beautiful letter detailing his father’s final days and hours. It is a moving tribute to a remarkable man. I have been told that it is okay to share. Please keep Carmen, Leo, and their friends and family, in your thoughts and prayers. A little more than a week after developing pneumonia, Geoffrey Holder made a decision. He was calling the shots as always. He was done. 2 attempts at removing the breathing tube didn’t show promising results. In his truest moment of clarity since being rolled into I.C.U. he said he was good. Mouthing the words “No, I am not afraid” without a trace of negativity, sadness or bitterness, he sincerely was good with it. He had lived the fullest life he could possibly live, a 70 + year career in multiple art forms, and was still creating. Still painting, a bag of gold (of course) fabric and embellishments in his room for a new dress for my mother, sculptures made out of rope, baseball caps and wire hangers. New ideas every second, always restlessly chasing his too fertile mind. A week of breathing tubes and restrained hands had forced him to communicate with only cryptic clues which I was fortunate enough to be able to decipher at best 40% of the time. The fact that we all struggled to understand him enraged him to the point that he could sometimes pull tantrums taking up to 4 people to restrain him from pulling out the wires. He was head strong (understatement), but he was also physically strong. Iron hand grip that no illness could weaken. 9 days of mouthing words that, because of the tubes, produced no sound forcing him to use his eyes to try to accentuate the point he was trying to make. But this didn’t mean he wasn’t still Geoffrey Holder. This didn’t mean an end to taking over. Holding court as he always did. Directing and ordering people around. Choreographing. Getting his way. We still understood that part, and the sight of his closest friends and extended family brought out the best in him. Broad smiles in spite of the tubes, nodding approval of anything that met his standard (which was very high), and exuding pride and joy in all those in whom he saw a spark of magic and encouraged to blossom. The week saw a parade of friends from all over the world checking in to see him, hold is hand, rub his head, and give him the latest gossip. But he was still trying to tell me something, and although I was still the best at deciphering what he was saying, I still wasn’t getting it. From noon on, a caravan of friends and family from all over the globe comes through the ICU wing. Ages 1 to 80. Young designers and artists he nurtured and who inspired him. Younger dancers he encouraged to always play to the rear balcony with majesty. The now “elder statesmen” dancers on whom he built some of his signature ballets. His rat pack of buddies. Wayward saints he would offer food, drink, a shoulder to cry on, a couch to sleep it off, and lifetime’s worth of deep conversation and thought. Closest and oldest friends. Family. They administer the morphine drip and put an oxygen mask over his face. and I watch him begin taking his last breaths.